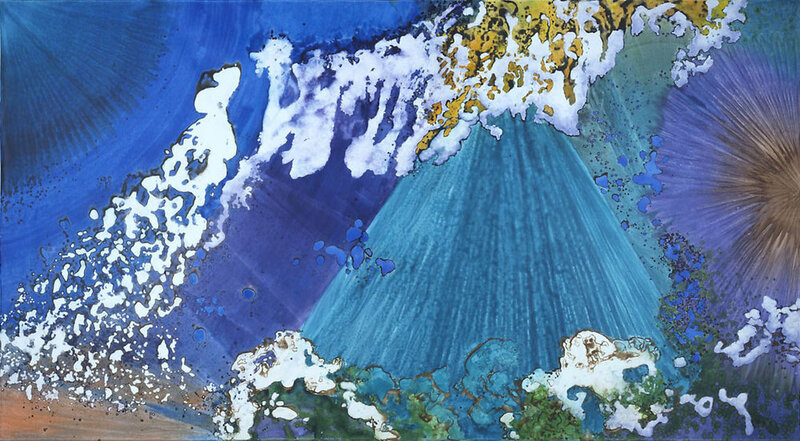 "Blue Crystal" 1998, Crystal Reef Series, acrylic on paper, 42 x 32 inches (107 x 81 cm). "Crystal Pyramid" 2003, Crystal Reef Series, acrylic on canvas, 10 x 18 feet (305 x 549 cm). "Crystal Pyramid" 2003, Crystal Reef Series, acrylic on canvas, 10 x 18 feet (305 x 549 cm), artist pictured. "Chrysandthemum Crystal", Crystal Reef Series. "Purple Crystal", Crystal Reef Series. "Crystal Dynamite", Crystal Reef Series. "Crystal Pyramid", Crystal Reef Series. "Crystal Pyramid" 1998, Crystal Reef Series. "Crystal Rays", Crystal Reef Series. "Crystal Reef Park", Crystal Reef Series. "Crystal Sapphire", Crystal Reef Series. "Jade Crystal", Crystal Reef Series.